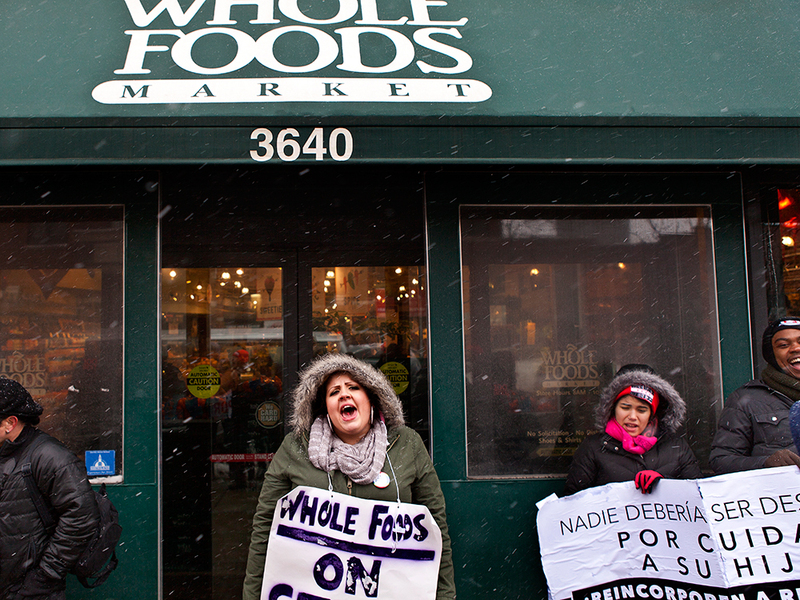 Rhiannon Broschat protested outside of the Whole Foods in Wrigleyville, on Feb. 5, 2014. She says she was wrongfully dismissed last winter for taking a day off on a day when Chicago Public Schools had closed because of inclement weather and she had no options available for childcare. I’m the mother of an 11-year-old boy. He’s very unique, and I think he’s the best kid in the world. He has a sense of humor, he’s very caring and vibrant. We love each other very much. Last January I missed work while employed as a cashier at Whole Foods. The polar vortex had hit Chicago hard. I found out the day before that the public schools were going to be closed because of the extreme cold. As any parent raising children in this city knows, it was a public-health hazard for kids to be outside in those temperatures. I tried all my options for child care, but there was no one available to watch my son. If I had gone into work as scheduled, he would have been left alone. And since my son has special needs, that simply wasn’t an option. Given the cold temperatures, pipes could burst – it happened in one of the neighboring buildings. So I called my job the night I realized I was coming up short on child care and again in the morning. When I talked to my shift leader, she was very understanding. But the next day I got a call from a manager telling me I was being “separated” from the company for “abusing” their attendance policy. They hadn’t excused the absence, and this ultimately put me over the limit of attendance points. The tricky part about these demerits is that they leave no leeway for emergencies that we have no control over. A violent winter storm or the onset of the flu, I realized, could cost my job. To this day — and I don’t think I’ll ever change my mind — I chose what was right for my kid. I had no choice. With the economy like it is, it is really difficult for parents, especially single parents, to have to choose between the wellness of our children or jobs. What happened to me is not unique. In fact, about 42 percent – around 460,000 people – of the private-sector workforce in Chicago do not have access to even a single paid sick day. For lower-income Chicagoans, those who most need paid sick days, the figure goes up to 77 percent. For us, paid sick days is about keeping our income and also keeping our job. A survey from the National Opinion Research Center at the University of Chicago found that nearly one quarter of adults in the United States have been fired or threatened with job loss for taking time off to get better or care for a sick loved one. I’m also a student at Northeastern Illinois University majoring in criminal justice and social work. I hope to go into the juvenile justice system in Cook County so that I can encourage children to stay in school, follow their dreams and never give up. I want my son to know that I didn’t do anything wrong in this situation. I want him to know there are lots of people like Mommy. I want him and others in this situation to know it’s OK to fight for what you believe in. There are companies that provide sick days because they value employees, making the workplace happier and customers, too. Guaranteeing paid sick days for all of us would be a win for business, the economy and all of us. On Feb. 24, Chicagoans will be able to vote on the paid sick days question on the ballot. The city’s already had one record-making snow day in 2015 which closed public school. And when going outside amounts to a public health risk, parents shouldn’t be punished for doing what any teacher, doctor or weather forecaster would recommend. We need to value families and we need public policy to help enforce those values. Rhiannon is a mother, worker and student.